​​Currently we focus on the Kansas City Region. However, applications for individual autism or PTSD service dogs are welcome from throughout the United States. All applications are considered on a case by case basis. We work with all above the age of 6. ​Everywhere we go people want to know! Who we are. What we are doing. What kind of dog IS that? What are their names? How do they help? Every outing is an outreach and education opportunity in the community. We are also available to speak with groups large and small, give in-services, or talk with families about how autism service dogs help. 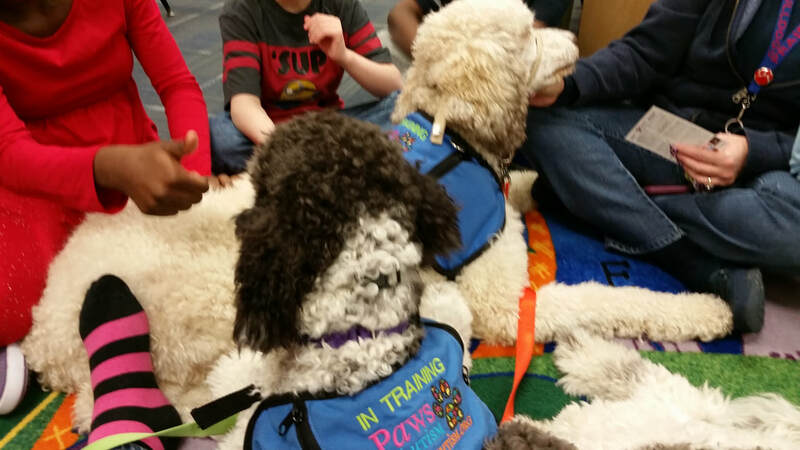 For local families who obtained their service dogs from an agency that does not provide local support for their clients or the school, we can assist with classroom integration or issues that may arise. CASSIE program in action at Ozanam. ​The CASSIE (Canine Assisted Social Skills In Education) Program uses modified Applied Behavior Analysis (ABA) techniques which targets social skills for individuals ages 6-18. Classes, grouped by age (6-10 years, and 11-18 years) are offered. The classes are led by a Special Education Teacher, Autism Specialist and Trainer who develops and measures individual goals for each student. CASSIE provides a FUN environment for kids who are interested and motivated by dogs to play and learn with peers. Social skills, including, but not limited to, conversation skills, body language, good sportsmanship, and classroom protocols are targeted during each class. All activities in class center on dogs, making it highly motivating for students to work as a team and develop friendships. 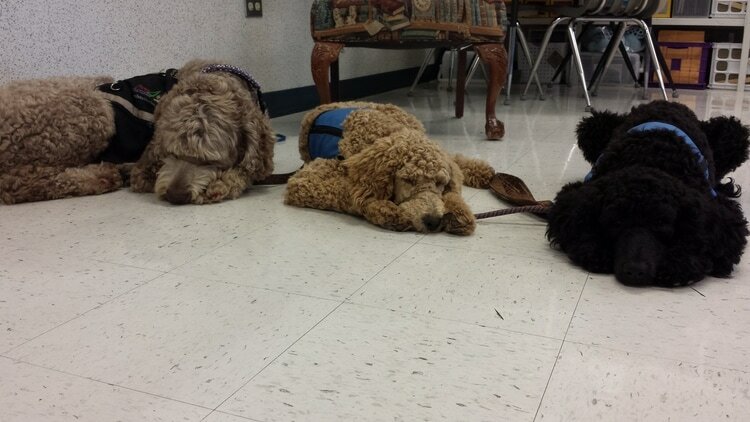 Partner work and group work are included in each class, including actual dog training. By working with other students with a common interest, the building blocks to developing friendships are in place. The dog training portion of class, where students are given the leash, is the highlight of each class. When the dog responds to the student’s direction, it gives the student a boost of confidence and keeps them coming back for more! ​Students in CASSIE typically have very high functioning autism or exhibit similar behaviors. Students must enjoy dogs to benefit from this program. Many of our students are passionate about dogs. Students who exhibit any physical or verbal aggression or who have a behavior intervention plan in place are not appropriate candidates for the group class and should instead consider our individual sessions. We are also available to incorporate our CASSIE program into existing childcare or youth residential settings such as our groups from the OACES program at Ozanam. Please contact us to find out more! An application and therapist approval is required prior to enrollment. Currently we are on a waitlist. Puppies from Wayside Waifs are often evaluated to become service dogs. ​Why raise a PAWS puppy? Your first answer might be, “because puppies are so cuddly, adorable and fun!” And you’re right—puppies are terribly cute, and raising an PAWS puppy is a lot of fun. But raising a future service dog also takes time, patience and commitment. Our volunteers all share one trait in common: they are willing to devote the time, energy and love necessary to socialize a puppy. Carefully-selected puppy raisers ensure that PAWS dogs are properly socialized and well-mannered. The dogs need exposure to all types of people and all kinds of environments, active as well as quiet. 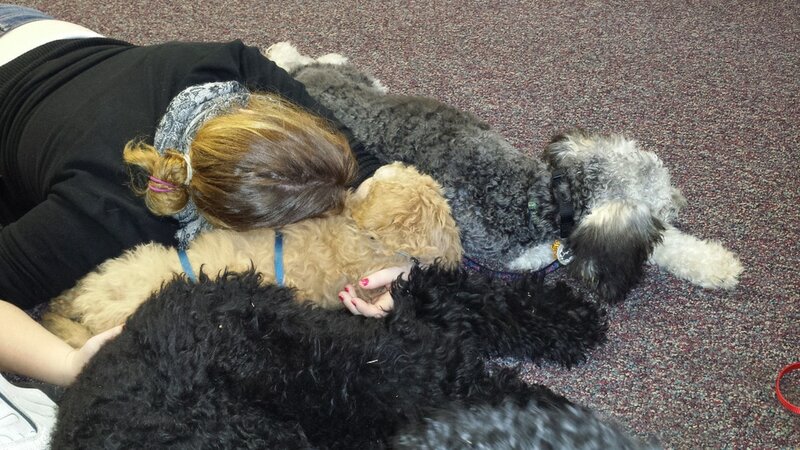 Puppies need stimulation, rest, and patient handling. The puppy-raiser’s goal is to raise an energetic and curious pup into a mature, dependable dog. 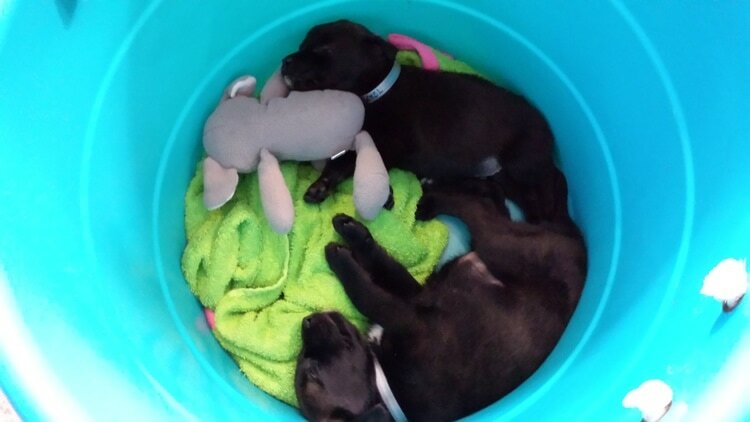 Although there is a lot of work involved in raising a PAWS puppy, the rewards are tremendous. By raising a PAWS puppy, you have made a huge difference in the quality of life for a child with autism and his or her family. Through our Puppy Partners Program, local (~30 mile radius) families are able to truly become a part of the training process and earn sweat equity towards the cost of their own service dog. They get to train and live with several different dogs throughout their tenure in the program and gain the experience and confidence of becoming basic trainers themselves. This also ensures the best match for both the family and the dog. There is an extensive application process and participation is limited. ​We provide professional therapy/facility dogs that assist professionals in the fields of education, counseling, healthcare, retirement or the legal system. ​Our continued commitment to serve youth in the autism community drives this organization to provide every opportunity to foster and encourage each participant and volunteer to help increase autism awareness and support for the community at large. Autistic youth are not afforded the same advantages that non-challenged youth in the community enjoy. Many will leave the educational system with little more than basic life skills. This program, if sustained, will expand the social and work skills of this demographic. The Train the Trainers Program will allow youth who have been diagnosed as falling within the autism spectrum to attain more comprehensive skill sets, while helping to train autism service dogs for youth in an expanded regional area at a reduced cost while also providing the opportunity to learn both job and social skills, thus increasing their long term employability. An increased connection to the community through expanded fostering opportunities. The EIP Training Center will be a community-based service dog training and autism awareness center. 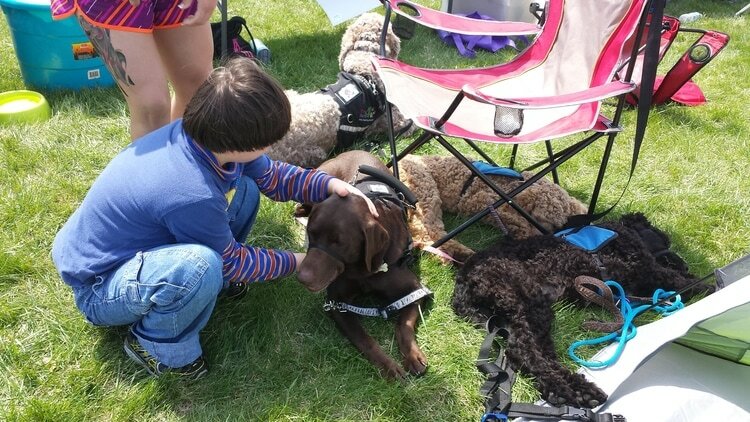 Paws 4 Autism will use the facility as a physical location to provide daytime obedience training for service dogs, as well as provide an opportunity for youth and young adults on the autism behavior spectrum to take part in hands-on training. This will increase the number of service dogs that Paws 4 Autism can provide, allow more families to foster our puppies in training, and provide an opportunity for youth and young adult volunteers to learn valuable life skills and work on social skills.